Kyocera was pushing the green message before it became fashionable, and this model continues the tradition. While many other manufacturers include the developer and drum with the toner cartridge, the FS-1300D's developer and drum are part of the printer - guaranteed for its working life - and the toner cartridge itself is simple and holds only toner. Official figures put the cost per page at 1.4p. The printer comes with a full cartridge, though half is dumped into an internal reservoir during the first run. 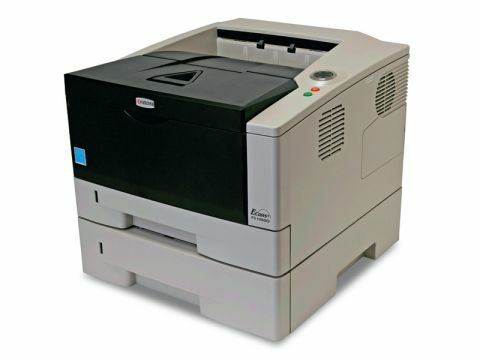 It can also print on both sides of paper automatically, sucking each sheet back in to print to the reverse. A 20-page text document took a minute to drop into the output tray when printed single-sided; 30 seconds were added on when using duplex. It's well worth it, and it's a simple checkbox in the Print dialog box. It's easy to set up, but the PDF manual devotes only a single page to the Mac. It makes no mention of how the printer supports Apple's zero-config Bonjour technology (making it easy to discover the printer on a network, instead of mucking about with the also-supported AppleTalk or IP addresses); nor does it direct you to the Bonjour services option in Safari that makes it a doddle to access the printer's internal config pages to set up network behaviour or security. We tested the DN version with an Ethernet port for networking; a USB-only option is also available. It's around £180, and while you could add a £170 network card to turn it into a DN, that's a pricey way to do it. Our model also had the optional £90 second paper tray; both bins only accept half a ream of paper each. Print quality isn't stunning, with very slight smearing and some lumpiness in text below 8pt, but it's easily good enough for general office duties. Images are predictably grainy, though you can crank the resolution up to true 1,200dpi, and PostScript 3 emulation will keep XPress and InDesign users happy.